Hearing the PIL (31229 of 2005) filed by the Kautilya Society, on 8th April 2015, a division bench comprising Chief Justice Dr Dhananjaya Yeshwant Chandrachud and Justice Dilip Gupta, directed the Central as well as state governments to inform on actions being taken in protecting the Varanasi ghats. While fixing the fixing May 5 as the next date of hearing on the matter, the court asked the UP State Principal Secretary (Urban Development and Planning) to expeditiously complete the framing of “model by-laws” for the protection and maintenance of the Varanasi ghats. The Allahabad High Court Order, following the hearing held on 11th September 2014, has formally declared that since Varanasi is of national importance, its conservation and development must be ratified by national-level experts. This hearing was requested by the U.P State Government as an appeal against a previous Allahabad High Court order that had stayed a pharaonic construction plan proposed by it. Vrinda Dar believes that development must be done for the benefit of the city and not for the developers. She said it is essential that whatever is planned for Varanasi should be done through a process of social dialogue that involves all stakeholders, local and national. Vrinda also said that any kind of development plan for Varanasi must include in the planning process, a team comprising atleast conservation architect, geologist, water engineering expert, accountable governance, urban planning. The Chief Justice of the Allahabad High Court, where the Kautilya Society has filed a PIL for protecting the heritage of Varanasi, has issued a strong order meant to force the Varanasi Administration to align to legal procedure. “The manner in which illegal constructions are being raised in and around the ghats at Varanasi would not be possible but for the complicity of the Administration and, at the least, the failure of the Varanasi Development Authority to discharge its statutory obligation”. The Court has also appointed an amicus curiae to assist the Court in the proceedings of the PIL. This means that the High Court of Allahabad recognizes the strong relevance of the issue presented by the Kautilya Society for public interest and that the Court not only intends evaluating the allegations made in the Court by the Kautilya Society but will also directly assess, monitor and evaluate the situation constantly. In the High Court Order, the Varanasi Administration has been ordered to give evidence of what it is doing in order to contrast illegalities. For the time being, however, the local administration is only continuing with the various forms of harassment against the Kautilya Society and against its Secretary, Vrinda Dar. The latest move in the series of harassment against the Kautilya Society has been the cancellation of its registration which was due for renewal. The Society has appealed against this decision in the local courts, contending that the allegation made by the Registrar Societies of ”violation of laws that govern the Society”, is totally false and baseless since there have never been any violations that the Society has always fully complied with all its statutory obligations. By trying to cancel the Society’s Registration, the local administration is in fact trying to silence its critical voice and stop the advancement of the Public Interest Litigation case. 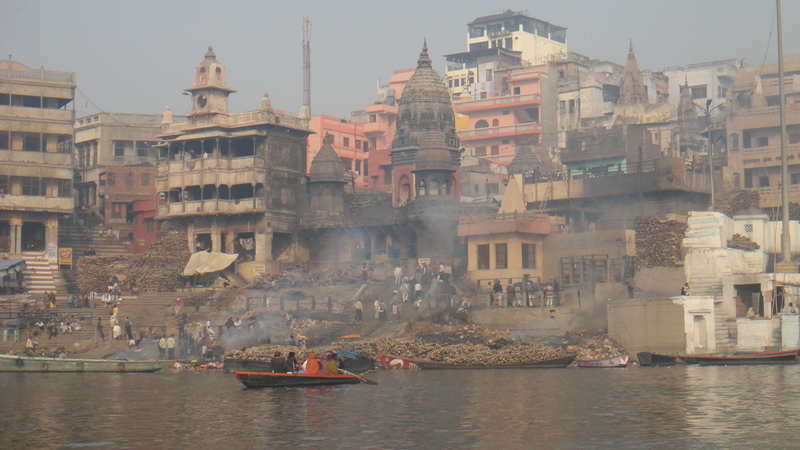 On 8 November 2013, the Allahabad High Court judge bench, comprising Justice Ashok Bhushan and Justice Arun Tandon, heard the PIL filed by the Kautilya Society on the Varanasi Ghats. On this hearing, the VDA was supposed to submit a response to queries on the irregularities of the Darbhanga Palace, made in the Allahabad High Court Order of 9 October 2013. The Darbhanga Palace is included in a list of 57 buildings officially declared by VDA as illegal constructions in violation of the Government Order prohibiting new constructions within 200 metres of banks of the River Ganga. The VDA had also submitted this list to the Allahabad High Court in May 2008. On the 8th November hearing, the VDA submitted an affidavit stating that the new four-floor building made in the rear portion of the Darbhanga Palace was an authorised construction. The VDA argued that the rehabilitation of the Darbhanga Palace was as per the map it had sanctioned in 1997 and 2005 and that no new construction had ever been made in the premises of this building. On the contrary, in the PIL hearing of 9th October 2013, the VDA had confirmed that the Darbhanga Palace owners had not complied with the conditions that were laid down in their order sanctioning the rehabilitation of the Palace building. On the 8th November hearing, the owners of the Darbhanga Palace also submitted an affidavit. They requested that the PIL, filed by the Kautilya Society in 2005, be dismissed in view of the FIRs (criminal cases) that had been filed against the petitioners of the PIL, i.e. the Kautilya Society and Vrinda Dar (who defends the PIL in person). They argued that the criminal cases lodged against the Kautilya Society and Vrinda Dar demonstrated that (i) the PIL was filed in private interest rather than in public interest and (ii) the credibility of the organisation was under suspicion. In its order of 9th November 2013, Allahabad High Court gave the petitioner three weeks to respond to the affidavits submitted by the VDA and the owners of the Darbhanga Palace. The next hearing of the PIL in the Allahabad High Court has been fixed for 18 December 2013. In our post of the 11th of June we reported the story of the first FIR filed against the Kautilya Society members. Fearing that the Varanasi authorities would use the non-bailable sections quoted in the FIR to prevent me from appearing in the hearings of the Allahabad High Court hearing (or at least be sufficiently harassed to withdraw the PIL from the High Court) I reported the whole issue to the Varanasi Superintendent of Police and asked them to verify if there was any improper use of power by the VDA against her or the Kautilya Society. Finally some response did come from the Varanasi Superintendent of Police. But it was not a response to the report of the Kautilya Society on misuse of power by VDA officers. And what was it? Another FIR! The second FIR was lodged on the direct and explicit instructions of Mr. Ajay Kumar Mishra, Senior Superintendent of Varanasi Police, on indication by the Varanasi Divisional Commissioner, Mr. Chanchal Tiwari. It charged all 9 founders of Kautilya Society of non-bailable criminal offences like “cheating and dishonestly inducing delivery of property (IPC 420), forgery of valuable security (IPC 467),” etc. The allegations that have been made do not give specific instances of irregularities but make general accusations that the KS has many foreign members and that the KS receives funds from foreigners. Both facts are true, but neither of them is an offence. All KS activities are implemented as per its bylaws and as per the rules and regulations of the country. The Times of India, in its article reported my statement, “since the filing of PIL we are being harassed in similar style as not only the local authorities but the entire machinery has been exposed on the issue of illegal construction in the prohibited zone. But we are prepared for it and under no circumstances will we withdraw the PIL” As in the case of the other FIR, Varanasi newspapers that were previously supporting the KS against the inefficient local administration have generally given ample resonance to the lodged FIRs without counter-checking the issue with the KS. The KS is contesting the charges and believes that it is a blatant case of malicious institutional harassment and misuse of government power. The main accusation is that Kautilya Society has foreign members in its Managing Committee. Sure, it is an NGO where foreigners are among its founding members as well as its current ordinary members. All foreigners who become members and sometimes also reside in the Kautilya Society premises are duly reported to the Local Police Office. The names and details of the Managing Committee members and the organisational activities have always been reported to the Registrar of Societies that has approved and renewed the official status of the organisation. The KS receives donations in Indian rupees from both Indian and Foreign members who avail of its services within the society premises and this is an activity within the bye laws of the Society, it is permitted under the FCRA (Foreign Currency Regulation Act 2010, Clause 2, Explanation 3) and it is regularly assessed and reported to the Income Tax Authorities through audited accounts. The Society has foreign members in accordance with its byelaws and the Memorandum of Association that is in accordance with the Indian Society Registration Act 1860 that permits foreigners to subscribe to the Memorandum of Association of a Society. The names and details of the members of Kautilya Society Managing Committee has always been shared with the concerned offices. The names and details of all foreign members who consult our study and resource centre, visit, work with us or stay in our premises have always been declared to the Local Foreign Registration Office. Our funds are always audited and submitted to the concerned offices. In a recent scrutiny conducted by the Income Tax Department of the Govt. of India, our financial details and accountancy were considered as per laws and clear. Not only are our activities and documents regular but they have regularly been submitted to concerned authorities and received official approvals. When the KS management went to meet the Varanasi District Magistrate to object about the FIR, he was apologetic, saying that an FIR is not malicious and that it is just a necessary step taken by the Varanasi police after receiving many complaints from local people (on Facebook!). Perhaps it is true. But one can surely suspect malice because non-bailable charges in the FIR have been made on a very well known organization that has been a partner of the District Authorities for many years and with which, in the past five years, there has been a fierce, but until now honest, litigation in the Allahabad High Court. And what is particularly inappropriate is the accusation of “Forgery for purpose of cheating” (469 of IPC) and “using as genuine a forged document” (471) concerning the authorisation by Indian authorities to carry out civil society activities in Varanasi, when in fact the authorisations have been given in writing by the Indian authorities themselves. I thinks that both FIRs are basically forms of harassment and mental torture meant to discourage her from proceeding with the PIL. But she wants to continue and she wants the Varanasi people to be informed about what is happening. She has shared a video interview on ⇒ the TVP channel. On the facebook page of the Kautilya Society, she sent an appeal to all members and friends to share her message, and this article, as widely as possible so that she is not left alone in bearing harassment in return for demanding legality in Varanasi; and for trying to preserve as much as possible of the Varanasi heritage so that future generations can better understand the values of the Indian traditional culture. “Varanasi Development Authority (VDA) officers are misusing their official power to harass citizens” — Kautilya Society, June 11, 2013. “Varanasi Development Authority (VDA) officers are misusing their official power to harass citizens” — Kautilya Society, June 8, 2013.
the Government Authorities say that they have acted on the basis of complaints they received from the public, but then they filed criminal charges against me before even contacting me or requesting me for clarifications on issues for which they are receiving such complaints. This is not the standard way of dealing with complaints. What was their haste in filing an FIR before asking questions? In both the FIRs, I am accused of infringing norms of the Indian Penal Code that are not bailable (i.e. these sections of the Indian Penal Code that permit the police to arrest me without bail) but these are inconsistent with the allegations made in the FIRs. Even if we were accused of wrongdoings, these would come under the civil law, not under the Penal Code. Penal Code sections have been quoted in the FIRs without linking the alleged actions with the Indian Penal Code norms. I am accused of carrying out illegal civil society related activities, while these have been regularly reported to the concerned Indian Authorities and for which I have received, in writing, required permissions and certifications. In the FIRs, I am accused by Authorities of forging documents that in fact are regular certifications provided by the competent authorities. Di solito siamo presi dalla nostra routine e la mattina ci mettiamo per la solita strada con la solita fretta, lamentandoci di come le cose vanno peggio di come sarebbe giusto che andassero e pensiamo a quanto il mondo sarebbe migliore se seguisse di più le regole che noi pensiamo dovrebbe seguire. Ma non è sempre così. A volte ci capita di uscire dalle nostre frette e dalle nostre abitudini intellettuali. A chi è mai capitato di camminare da solo in una strada di un paese straniero, in un giorno vuoto da impegni di alcun genere, di girare per i vicoli sconosciuti della città, senza tirare la guida turistica fuori dalla borsa: e in queste circostanze, inaspettatamente, di smarrire la preoccupazione di essere da soli, di essere in un paese straniero, di non conoscere la strada e improvvisamente accorgersi che tutto quel “diverso” è incredibilmente familiare. Non conosciuto, eppure vicino, terribilmente vicino. Coloro ai quali è capitata quest’esperienza sanno a cosa mi riferisco; gli altri ascoltino bene, perché è una bellissima esperienza che possono provocare in sé stessi e che suscita un’emozione così profonda da cambiare la nostra visione del mondo. In quei momenti ci si sente al di fuori del ritmo quotidiano ordinario del tempo. Per un po’ il vortice degli eventi sembra perdere energia, non ci costringiamo più a usare in modo produttivo il nostro tempo, la fretta scompare e si apre una visione diversa. Quelle strade per cui stiamo camminando – così diverse dalle strade alle quali siamo abituati – improvvisamente ci conducono dentro le cose. I panni stesi ad asciugare ci colpiscono non solo perché hanno foggia diversa dalla nostra ma perché, guardandoli, intuiamo i segreti della vita familiare della casa sulla quale sono appesi. Nei caffè dove entriamo non ritroviamo quello che siamo abituati a prendere. Ordiniamo quello che stanno bevendo i nostri vicini di tavolo e, assaggiando cose di cui non cosciamo la formula, riusciamo ad intuire come i gusti dei cibi e delle bevande facciano parte integrante della costruzione di un’identità sociale. Ci sforziamo di riprendere un ruolo più normale e ci rimettiamo a comportarci un po’ da turisti (anche per giustificarci davanti agli altri dei motivi per cui siamo lì). Entriamo nei templi, costruiti con un’architettura così diversa dalla nostra. Ma noi, entrandoci, cogliamo il senso della bellezza che muove le persone alla preghiera. In queste giornate noi siamo soli, eppure ci sentiamo più vicini al mondo del solito. Non capiamo quello che le persone dicono tra di loro, eppure capiamo quello che hanno da dirsi. Non sappiamo quello che è scritto sui giornali locali, eppure ci sembra per la prima volta di capire perché ci sono i giornali. Non conosciamo quella cultura, eppure riusciamo finalmente a capire che cos’è la cultura. Non siamo in grado di capire cosa è che improvvisamente ci fa cambiare prospettiva e perché in quei momenti riusciamo a vedere qualcosa che non riuscivamo a vedere nella nostra vita ordinaria. Ma capiamo che questo cambio di prospettiva è il motivo per cui viaggiamo. È il “bello” del viaggio. Chi lo ha assaporato sa che ci sono poche cose al mondo che hanno un gusto e una bellezza altrettanto profondi. Questa esperienza estetica, che ci capita all’improvviso nel viaggio, può essere coltivata. Quello che si è intravisto nell’osservazione dell’ambiente straniero, può essere meglio conosciuto facendo amicizia con le persone, leggendo la letteratura, partecipando ad eventi e cerimonie, accettando l’ospitalità e nutrendo la curiosità. Eppure accumulando conoscenze non si accumula necessariamente la bellezza. Il bello è la meraviglia stessa, che non può accontentarsi di rimanere ignorante. Ma questa meraviglia può essere minacciata dalla conoscenza, se questa assume un ruolo saccente e vuole farci smettere di fare domande curiose. È bella la diversità e la nostra vittoria è il riuscire a guardare il mondo da una prospettiva diversa. Quando riusciamo ad adottare, anche temporaneamente, questo nuovo punto di vista, il nostro universo si allarga, tutto diventa più vario e ricco di fascino. Meravigliarsi diventa quindi un modo di “conquistare” il mondo e renderlo autenticamente nostro. E da questa prospettiva capita allora di tornare alle proprie abitudini riuscendo a stupirci di esse, perché riusciamo a guardarle dalla nuova prospettiva appresa nel viaggio. Al ritorno, possiamo allora capire molto meglio il nostro stesso mondo. E questo è l’altro grande motivo per cui è bello viaggiare. Questa del viaggio è l’esperienza estetica dell’incontro. Senza diversità non c’è incontro. L’incontro è un successo. Perché avvenga l’incontro c’è bisogno di rimuovere un ostacolo. Di superare una difficoltà. L’incontro, grande o piccolo, è una vittoria. Una vittoria conquistata con grandi difficoltà; oppure una vittoria avuta in grazia dalla vita. Ma è sempre una vittoria. Senza l’entusiasmo della vittoria non c’è gioia nell’incontro. Ma ci sono vittorie e vittorie e la vittoria che produce l’incontro è molto più bella che non la vittoria che produce la sottomissione dell’altro. Nell’incontro entrambi possono vincere. Anzi, entrambi vincono sempre. Nella sottomissione uno dei due perde. Anzi. Perdono tutti e due. Perché anche il “vincitore” perde per aver perso l’opportunità di vivere un incontro. Non c’è bisogno di fare viaggi in luoghi remoti per gustare l’estetica dell’incontro. Ogni persona è un universo diverso e per riuscire a entrare in dialogo con un’altra persona occorre già mettersi in viaggio al di fuori dei propri confini personali. Ma direi qualcosa in più: non è forse ogni esperienza estetica un’esperienza di incontro? Che cosa è l’arte se non una piattaforma per l’incontro. La bellezza è ciò che si prova intuendo la natura dell’altro. I grandi artisti sono coloro che ci offrono una grande opportunità di raggiungere la loro anima, e di ritornare alla nostra arricchiti di una nuova prospettiva su noi stessi. Qui naturalmente per arte non ci riferiamo soltanto, seppur anche, alla grande letteratura, alla poesia, alla pittura, ecc. Ma ad ogni forma di autentica espressività umana che diventa arte quando è in grado di evocare la bellezza dell’incontro. Proprio per questo motivo l’apprezzamento estetico è una grande vittoria anche per colui che apprezza l’arte e non solo colui che la esprime. Infatti è una vittoria del fruitore dell’arte che riesce a intuire cosa l’artista ha da dirgli perché è riuscito a mettersi in viaggio al di fuori dei suoi soliti preconcetti. La costruzione della bellezza dell’arte – dicono i critici – è fatta sempre in due: da chi esprime e da chi comprende. E allora potremmo dire che l’arte è sempre un dialogo. Avevamo detto della bellezza del viaggio. Ora parliamo della bellezza del dialogo. Ma sono poi due cose diverse? Un viaggio che non è un dialogo, come può essere bello? E un dialogo che non è un viaggio – potete immaginare niente di più triste? Un bel dialogo è dove le persone si avventurano fuori dai propri pregiudizi per incontrare la persona controparte. Ma non si tratta di una semplice visita turistica nella mente altrui. Il vero dialogo è collaborazione ad una costruzione nuova. Insieme stiamo facendo la nostra opera d’arte. Incrociamo le nostre opinioni per arrivare a realizzare un piano d’incontro. Nell’arte del dialogo non solo l’ascoltare è più importante del parlare; ma il parlare stesso serve fondamentalmente per dare all’altro la possibilità di parlare meglio. Così, tramite il dialogo, si realizza l’arte di incontrarsi, che produce in noi un risultato sorprendente. Mentre parliamo diciamo cose belle e nuove. Ma non nuove per l’altro! Nuove per noi stessi. Sono le nostre idee: eppure non le conoscevamo prima di dirle, non ci erano chiare prima di entrare in questo dialogo. Sono quindi sì nostre idee (le stiamo dicendo noi!) eppure sono state costruite insieme, sono l’opera che abbiamo realizzato insieme, nell’arte del dialogo. Perché, come solo quando torniamo da un viaggio riusciamo a vedere veramente la nostra cultura, così riusciamo a vedere veramente noi stessi solo dopo essere usciti dai nostri pregiudizi. Il gusto del dialogo diventa allora il fattore fondamentale per aprire la nostra mente; nel senso di fiducia, che segue al piacere dell’incontro, riusciamo ad esprimere noi stessi con un senso di lealtà e fiducia. Come succede al viaggiatore, che viaggia per conoscersi, così succede a ognuno di noi che si apre all’incontro per essere più autenticamente se stesso. Non un sé stesso fatto di definizioni identitarie. Ma un sé stesso universale, che nasce e si rinnova dall’esperienza estetica dell’incontro col mondo. Our only asset is the past. We have many plans, many desires, many fears for the future. We live our present life oriented towards the future. Without hopes for a better future there would be no motivation to study, to share, to act, to keep up. But the means we use for living and growing have arrived to us from the past. From the past we have inherited the culture, the manners, the paths. And we also have been supplied with a good deal of unsolved problems: finding new solutions is our present enterprise. From the past we have inherited the knowledge, the tools, the laws that we need now for solving these problems. Our new solutions will create new problems that the people of the future will have to solve. And what they can use for their future endeavours are the knowledge, the tolls and the laws which we will be able to hand over to them. We are now enjoying many fruits of development. The way of thinking that has made the development possible has been handed over to us by the previous generations. They have handed over to us technologies more effective than those they had received; medicines much more powerful, and social systems much better organised. We are enjoying all that. But we are also facing a new scarcity of good things that were better enjoyed in older times: previous generations had more time, a cleaner environment, more united families. We have a smaller world. They had more relaxed communities. So, sometimes, trying to solve the problems we are facing now we look back, trying to recuperate good things lost along the race for economic progress. And so we start re-appreciating the cultural heritages of the past: we search back for knowledge of the spiritual aspects of the human being, for ways to have more relaxed family life, for educational methods capable of fostering a deeper esthetical taste. In this search we travel to remote villages, visit old cities, learn old professions, receive initiation to traditional arts. In this search many of us have arrived toBanaras, a special city, where for centuries people have come in search of the old paths. InIndiato travel to Benares has always meant to abandon desires, struggles, achievements in order to renovate one’s spirit. It’s a town where the past is living, where the oldest traditions survive. For the world in the past 50 years to travel to Benares has become a sort if spiritual initiation to what has mainly been lost in the rest of the world. Many people arriving at Benaras are able to see beneath the veil of dirt and confusion to enjoy the magic of the place. It is a unique experience. It gives the possibility of returning to one’s usual environment with a broader vision of the human being and his destiny. This is the resource the Benaras offers to the future: a living possibility for confronting with the roots of human history. As far as ancient traditions are kept alive in places likeBanaras, we will have the possibility of comparing what we have achieved with what we have scarified. This will give us the possibility of correcting our mistakes. When traditions will die also in Benares, even if the facade of old palaces were preserved and the ancient manuscripts were all properly cataloged in the libraries, the world will be far poorer. And development will become far more dangerous. “We cannot spend our money for future welfare! We need to enjoy the returns for our investments!” This is the justification of those who are ready to sell off the common heritage. But investing for the future does not make us poorer: it will teach us how to share knowledge, which is the thing that makes us fertile. To care for others produces a richer culture. Through culture, we enlarge the limit of our consciousness, to include within our self-identity also the well being of the others, the well being of nature, the well being of future generations. If we are rooted on a value system that values culture, we will be able to enjoy the pleasure of “spending” for others, because we do not feel the others strangers, but as factors of our own deeper self. May Kashi be a model of responsible tourism ! Question: What is your opinion about the new trend of constructing hotels along the Ghats of Varanasi? Let me start by expressing what I consider to be most important. I strongly feel, like many other of my colleagues and the citizens of the world, that India has a responsibility towards the world and towards herself to develop in harmony with her spiritual and cultural identity. Varanasi is a universal heritage city and not just for urban Indian or foreign tourists. To betray Varanasi sand permit its cultural, environmental and social decadence or unsustained commercial exploitation of its unique heritage resources would be a betrayal to tradition and to our future generations. The development of tourism in India surely has vast economic potentials but selling out for short-term gains will lead to only the long term loss of her social and cultural identity. To render such development sustainable, it is indispensable that the traditional approach to tourism be continued; a tourism that is in organic harmony with the existing social and physical structure of towns. Utilising huge financial resources to unbalance the existing harmony is unsustainable. Religious tourism in Varanasi has given to the city, for centuries, enormous economic benefits while maintaining the development of spiritual, philosophical and artistic knowledge. Temples, royal palaces, and ashrams have been the focal points for such tourism. Foreign tourism interested in observing such traditions was begun by the British. It developed outside the cultural and religious centers of towns, usually in the cantonment areas. These too have contributed to increasing the wealth of the area and to the success of large chains of hotels like the Clarks, Taj, etc. However, utilising these models to unsettle existing patterns of hospitality and tourism is dangerous for the tourism industry itself. Do you think that construction of hotels could be one way of financing the conservation of old palaces and structures along the ghats? I don’t think that construction of large hotels is the sustainable solution. Large chains of hotels usually bring their own personnel, managers, shops, etc and employ the local labour only as the lower staff. They don’t use the local boatmen, local shops, brahmins, masseurs, etc. and their luxury tourists don’t venture out to see tiny and congested lanes which are the beauty of a town like Varanasi. This not only has a negative economic impact on the local people but also contributes to killing local jobs and sustained employment patterns. It burdens the local carrying capacity in water and electricity usage, pollutes the already congested areas with CFCs from air conditioners and poisonous fumes and noise from generators. Ashrams, maths and small guest houses are undoubtedly much more integrated and in harmony with the existing social, religious and cultural dynamics of the town, the ghats and the river. Hotels should be the last resort of any development plan along the ghats of Varanasi. Towns like Puri, Haridwar, etc. are already facing the invasion of such hotels and their unsustained presence, both culturally and physically. The construction of only those hotels- small or medium sized- must be permitted that leave totally undisturbed the human and physical environment surrounding it. Such economic initiatives must not be dictated by large economic interests but must follow de-centralised patterns. They must emerge from the grass roots, from within the local environment, the mohalla. True democracy always emerges from the roots and is the only kind culturally and socially viable in the long run. This is what really the Mahatma Gandhi advocated in his philosophy of Khadi and Swadeshi. His was an approach to contribute to the global culture by preserving local identities. Varanasi holds a sublime place in Indian consciousness. What is done in this city will be an example for the rest of the nation. Will India decide to respect her soul and find an original solution to the need for development or will she simply acquiesce to global patterns?